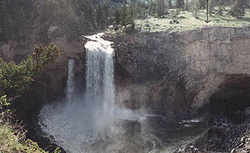 Constrained by a deeply cut chasm during high water, the Boulder River flows over a 100-foot precipice, creating the spectacular Boulder River Falls. At low water, the river flowed under a natural rock bridge, but in July 1988, the bridge that gave the area its name collapsed. The park also serves as a wilderness trailhead and has good trout fishing. The park is 40 acres in size and is 5,000 feet in elevation. The site offers a picnic area with scenic overlooks, interpretive plaques explaining the geologic process, and paved trails. Some trails are steep, so good walking shoes are recommended. This is a great place for photography. The Natural Bridge footbridge is legal access to Teepee Mountain, Contact Mountain, and Green Mountain. Directions: Natural Bridge State Monument is located 27 miles south of Big Timber on Secondary 298.